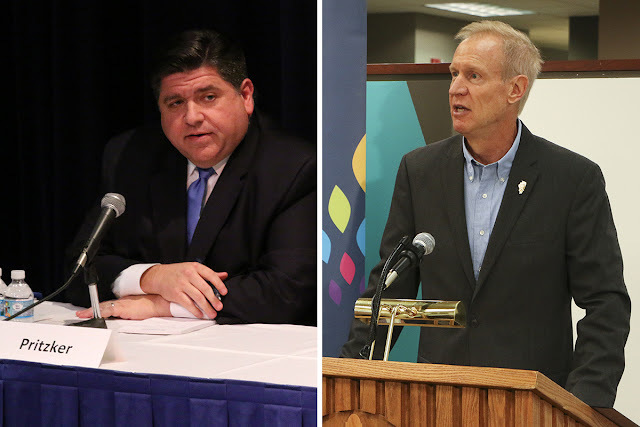 A new statewide survey conducted by the University of Illinois Springfield’s Center for State Policy and Leadership and NPR Illinois shows Democrat J.B. Pritzker leads Republican Governor Bruce Rauner in the race for Illinois Governor by 12 percentage points ahead of the November 6, 2018 general election. The July-August telephone survey (cell phone and landline) received responses from a representative sample of 717 registered voters, with a ± 3.66% margin of error. Thirty-five percent of those who answered the Illinois Issues Survey said they would vote for Pritzker compared to 23 percent for Rauner. However, another 15 percent indicated they would vote for someone else, and 27 percent said they were still undecided at the time the poll was taken, a number which will shrink as the election nears in November. The survey found that 35 percent of respondents identify as Democrats and 23 percent as Republicans. Downstate, Republicans (31 percent) outnumber Democrats (24 percent) while in Chicagoland, Democrats (40 percent) are much more numerous than Republicans (18 percent). Republicans are more likely to identify as conservative (63 percent) than Democrats are as to identify as liberal (53 percent). Perhaps unsurprisingly, the large majority of respondents (75 percent), regardless of party or ideology, think Illinois is on the wrong track. When asked if they have considered leaving the state in the past year, 53 percent of all respondents said yes. Voters under 35 years of age were more likely (67 percent) to say this than those 35 and older (51 percent). One of the hot issues in the current gubernatorial election is whether to move from the current flat income tax, where everyone pays the same rate, to a graduated income tax, where those with more income pay a higher rate. The survey found that 57 percent of respondents favor a graduated income tax, with support strongest among Democrats at 69 percent and somewhat less among Independents at 56 percent. However, even a substantial minority of Republicans (41 percent) indicated a preference for a graduated tax compared to the current flat rate. Over three times as many respondents said they believe immigrants help (63 percent) rather than hurt (20 percent) Illinois. But, opinion was sharply divided on this question by partisan affiliation. Whereas 83 percent of Democrats and 62 percent of Independents see immigration as a help, only 36 percent of Republicans share this view. Respondents gave strong support to increasing state funding for public higher education in order to hold down the costs of tuition. Three-fourths said this should be a high priority for the state. Regarding the tendency of high school graduates to attend college outside the state, 40 percent of respondents said individuals go elsewhere because Illinois is too expensive and 37 percent point to uncertain state funding as the cause. Other policy topics covered by the survey include term limits, undocumented immigrant children, school vouchers, gun rights, healthcare access, drug abuse, social trust and trust in the media, and today’s political and racial divisions. The 2018 Illinois Issues Survey is the first in a planned long-term project which examines the policy preferences of Illinoisans. The study examines policy issues relevant both at the state and national levels across a wide variety of areas. Read the full report on the NPR Illinois website. Questions about the report may be directed to Matthew Case, visiting research manager, at 217/206-6293 or mwcase2@uis.edu.